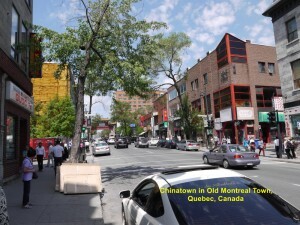 Montreal City has a pristine place, Old Montreal Town, on the Saint Lawrence River in Quebec Province, Canada. 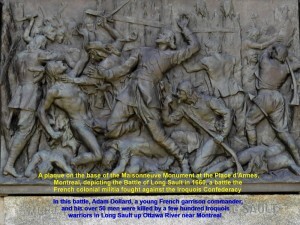 The first Europeans to settle there were the French. A French explorer, Jacques Cartier, discovered it in 1535. 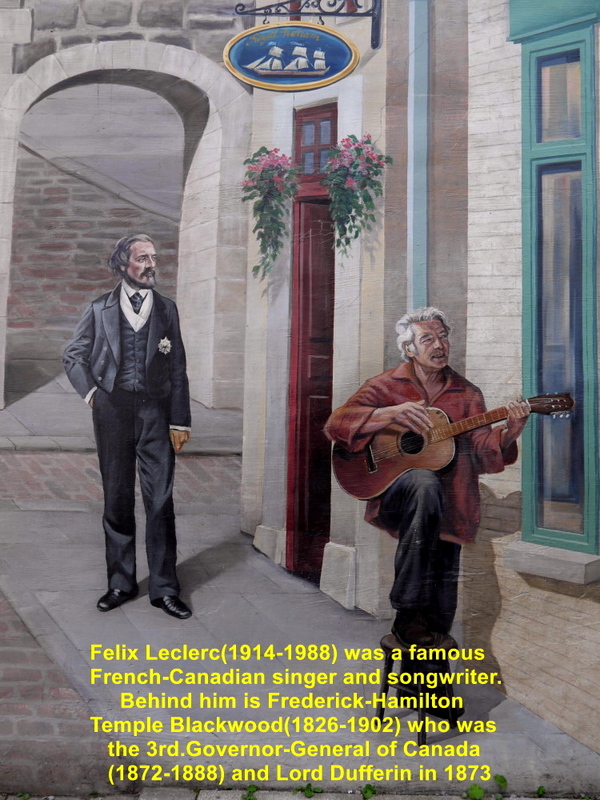 Later, many French migrants arrived and built wooden dwellings similar to those in their motherland, France. 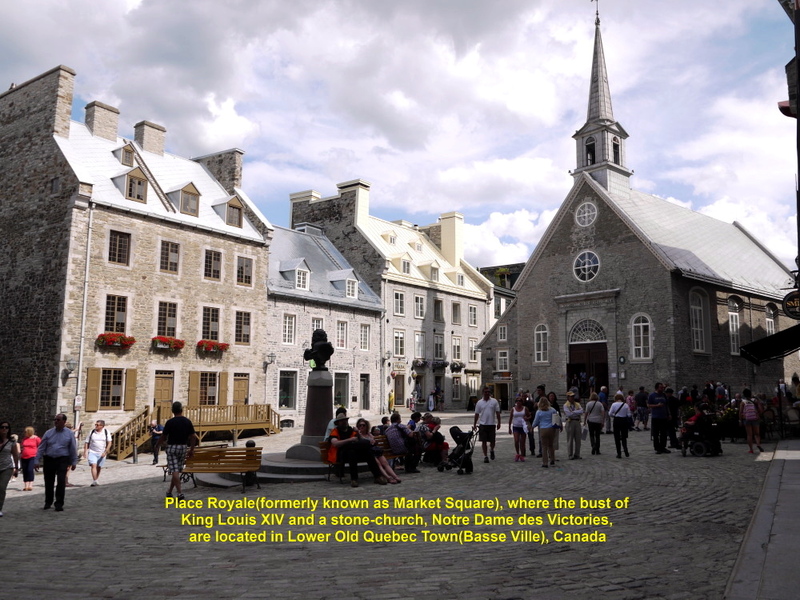 Then rich French merchants built stone buildings in French architectural style of their times(1700’s and 1800’s) at the place. 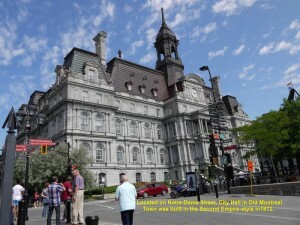 These buildings were rebuilt and are restored in their former glories. 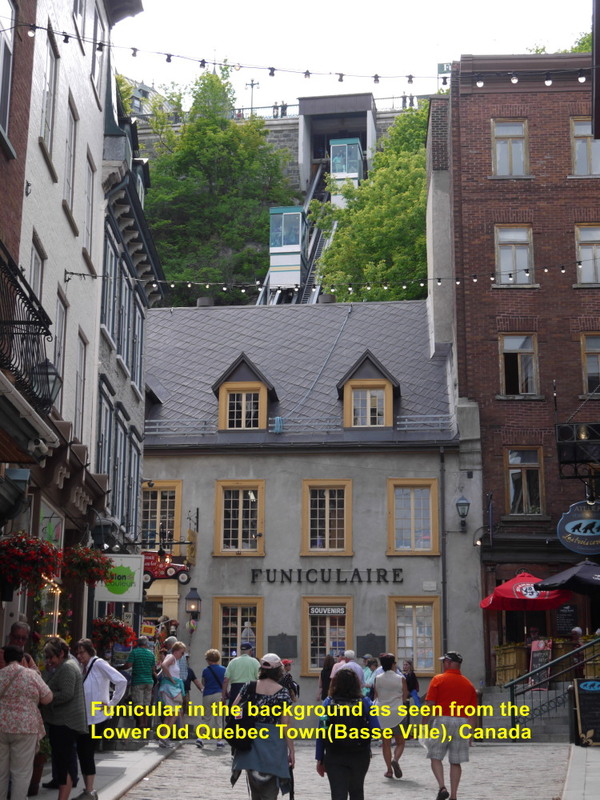 Strolling along the old roads lined with these quaint buildings will make a visitor feel as though he is in an old French town. 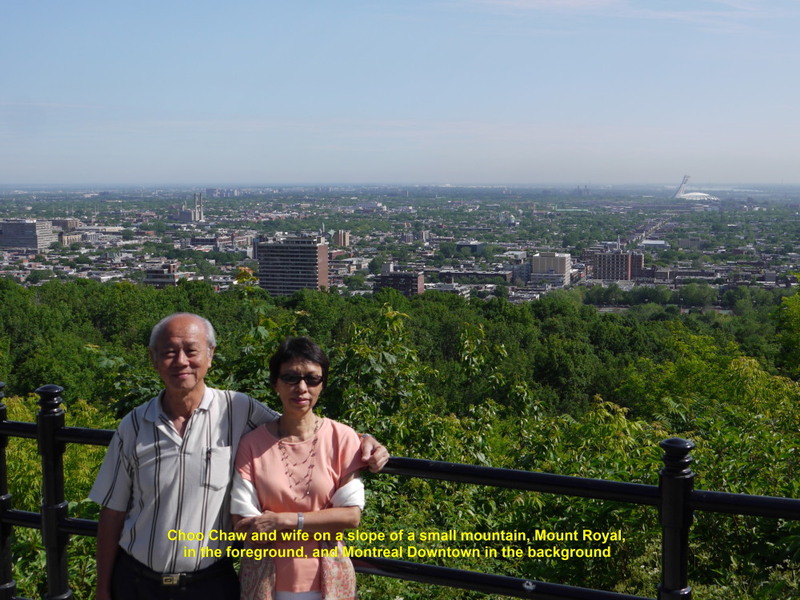 At 9.30 a.m. on 17 June 2015 my tour group and I left Sheraton Hotel near Montreal Airport where we had stayed for a night. 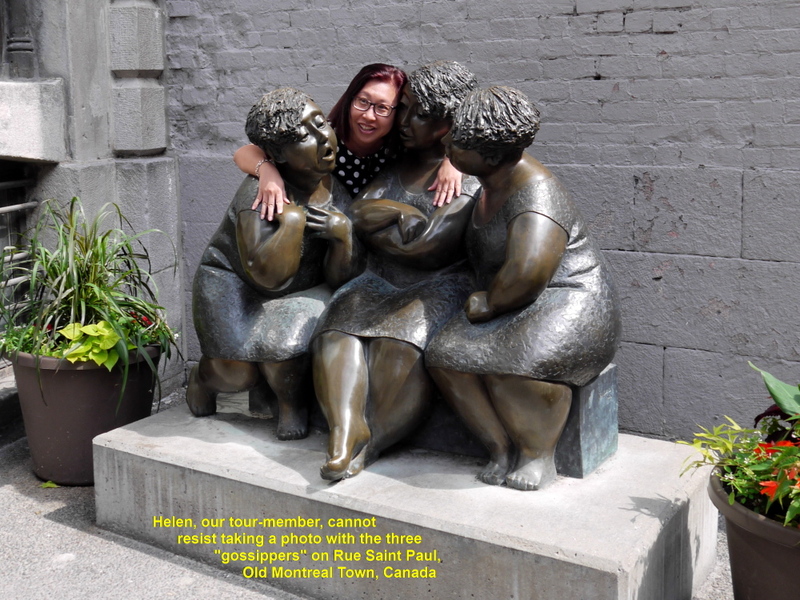 Our tour coach driver, Roanne, was going to bring us around Old Montreal Town on that day. 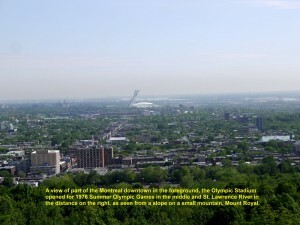 But first she would drive us to a hill, Mount Royal, to see the whole Montreal City. 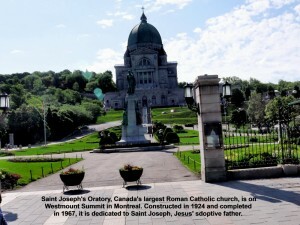 On the way to the hill in the outskirt of the city, we saw Canada’s largest Roman Catholic church on Westmount Summit known as Saint Joseph’s Oratory. It was built in Italian Renaissance architectural style in 1924 and completed in 1967. 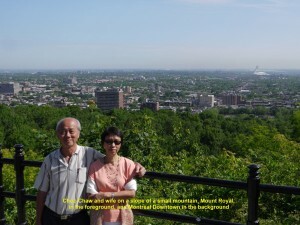 As soon as we reached the high slope of Mount Royal, we stepped out of the coach and saw a spectacular, panoramic view of Montreal City. In the distance, we saw a prominent white structure. 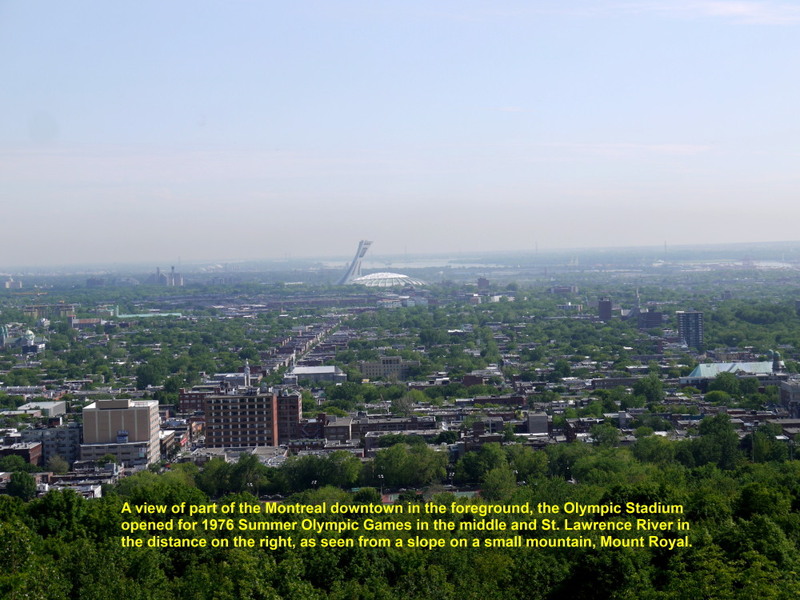 It was the Olympic Stadium where the Summer Olympic Games were held in 1976. Besides, we saw River St. Lawrence in the background. 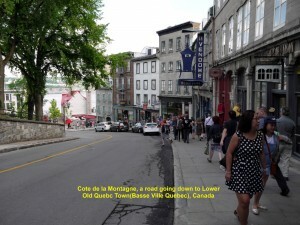 Several minutes later we left the place and went to Old Montreal Town. In the old town, Roanne, our coach-driver dropped us near Vauquelin Square. 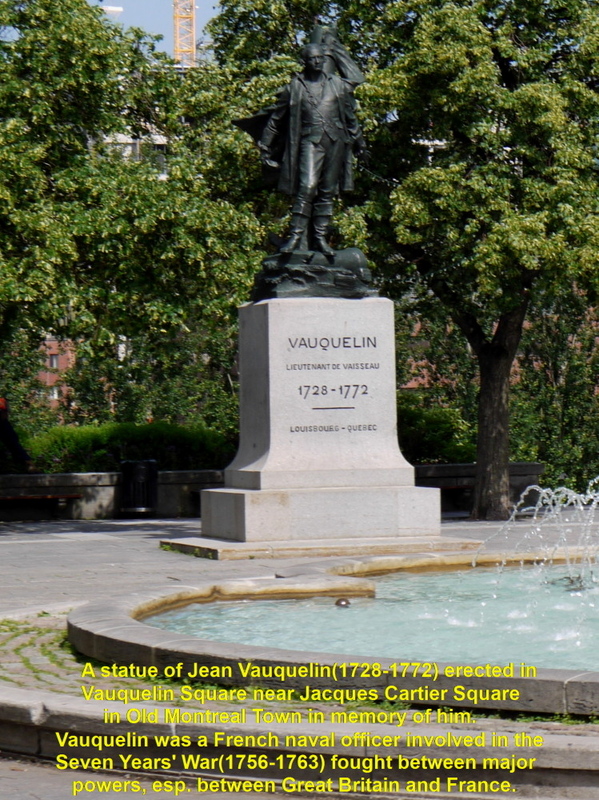 While walking to Place Jacques-Cartier, we saw a statue of Jean Vauquelin(1728-1772) in Vauquelin Square. 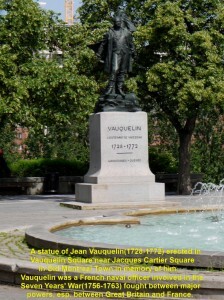 Vauquelin was a naval officer involved in the Seven Years’ Wars(1756-1763) which was fought between Great Britain and France. 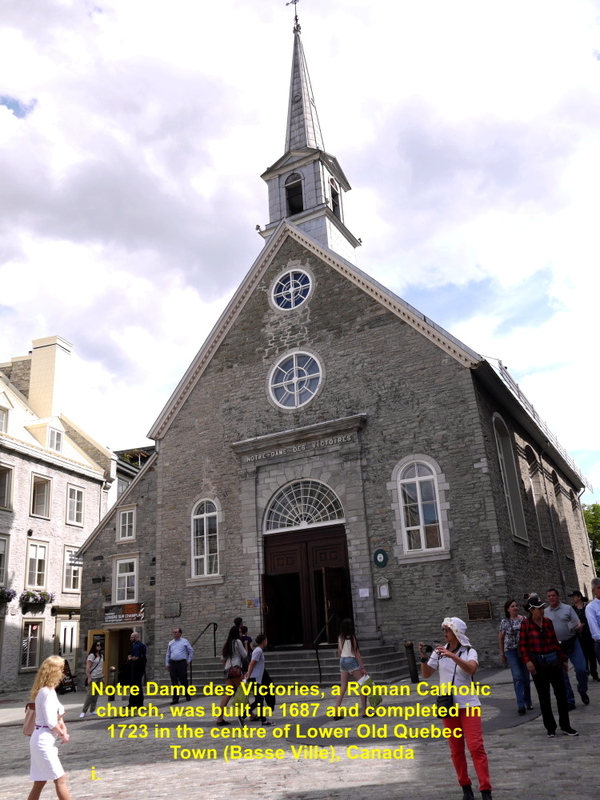 Then we saw a beautiful building in Notre-Dame Street built in Second Empire style in 1872. It was a City Hall. 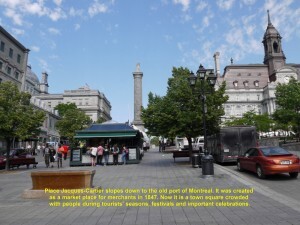 Soon we were at Place Jacques-Cartier. 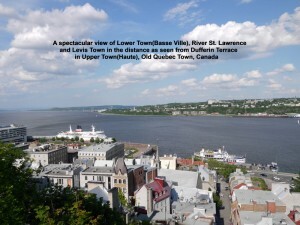 It slopes down, gently, to an old port on River St. Lawrence. 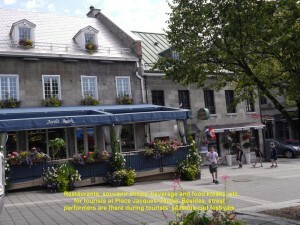 It was a market place in 1847. 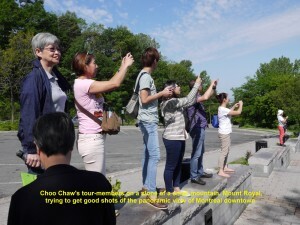 Now it is a public place where festivals are frequently celebrated. Restaurants, souvenir shops, beverage and food kiosks, etc. can be found there. 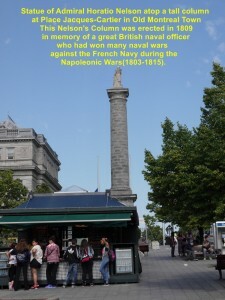 Erected in 1809 on the higher part of the square is a tall column with a statue of Admiral Horatio Nelson atop. 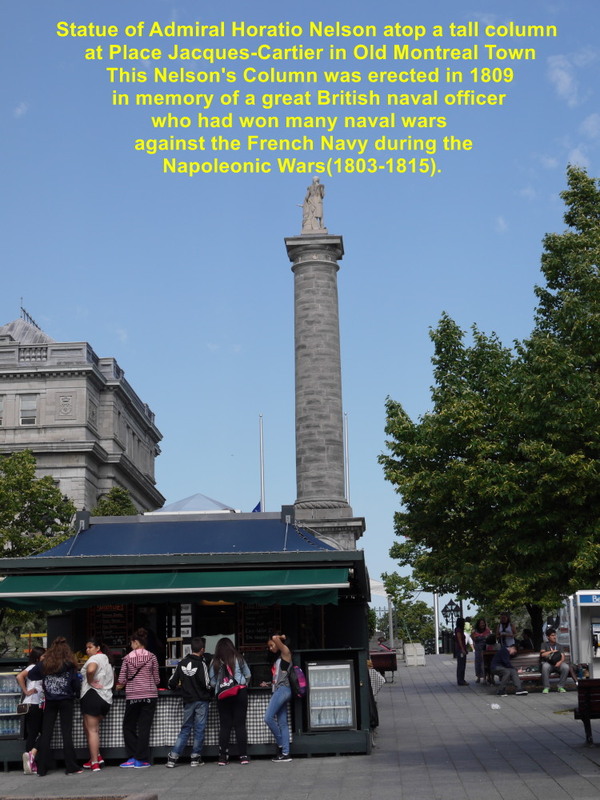 Nelson was a great British naval officer who had won many naval wars against the French Navy during the Napoleonic War(1803-1815). 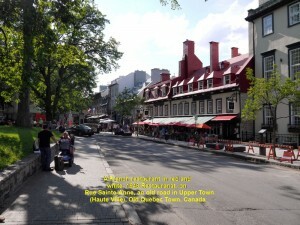 To walk to Place d’Armes. 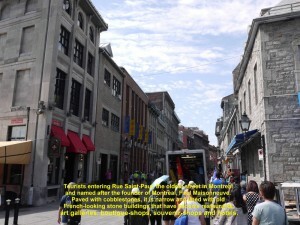 First, we entered Rue Saint Paul from Place Jacques-Cartier. The narrow road is paved with cobblestones and lined with old French-looking buildings of restaurants, art galleries, hotels, souvenirs, boutiques, etc. After walking half way, we were attracted by a sculpture of three bronze figures. 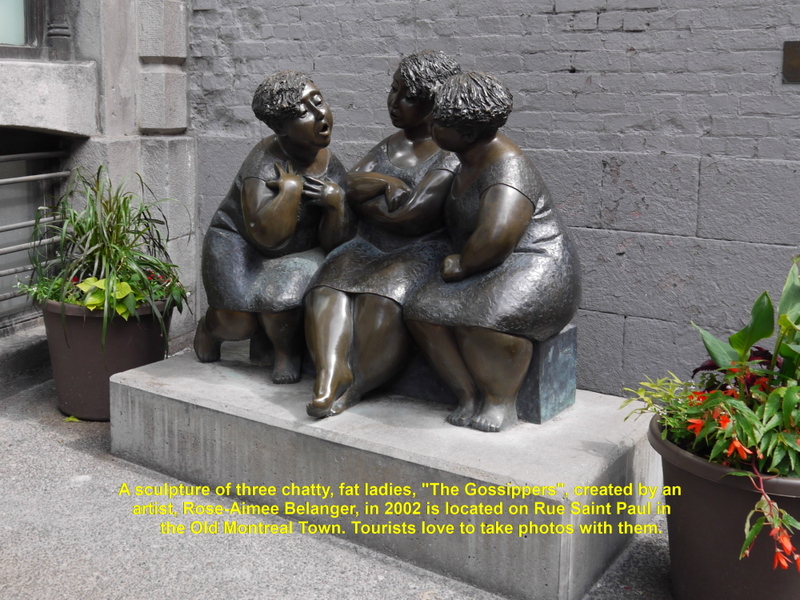 They were chatty, fat ladies. Created by an artist, Rose-Aimee Belanger, in 2002, the sculpture is known as “The Gossippers”. As some of us were fascinated by the figures we took a photo with the charming “ladies”. 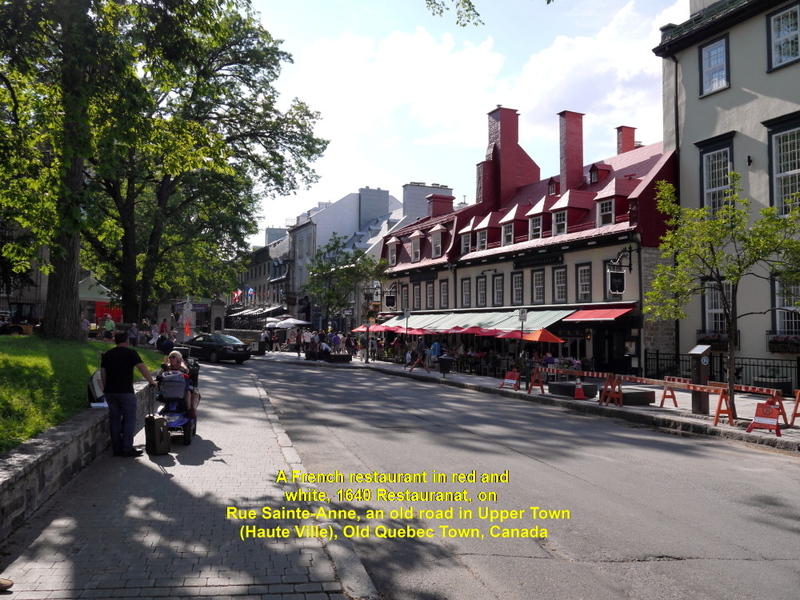 Soon we reached Place d’Armes. 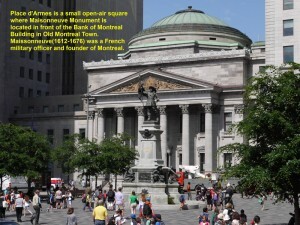 It is a small open-air square where a majestic-looking building in neoclassical style known as Bank of Montreal is located on one side and a Roman catholic church, Notre-Dame Basilica, built in Gothic Revival architecture(1824-1879) on the other side. 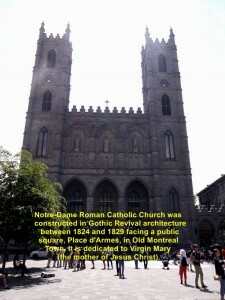 The bank is the largest in Canada and was built by an English-born architect, John Wells(1789-1864) in 1847 whereas the grand church or basilica built by an Irish-American architect, James O’Donnell(1774-1830), in 1824-1829 is dedicated to Virgin Mary. 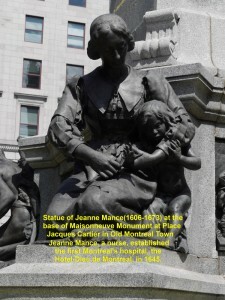 Maisonneuve Monument was erected in 1895 in front of Bank of Montreal Building. It is to honour Paul Chomedey de Maisonneuve(1612-1676) for being the founder of Montreal. 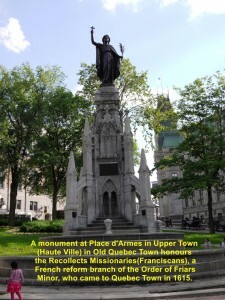 A Canadian artist and sculptor, Louis-Philippe Hebert(1850-1917), created that monument. 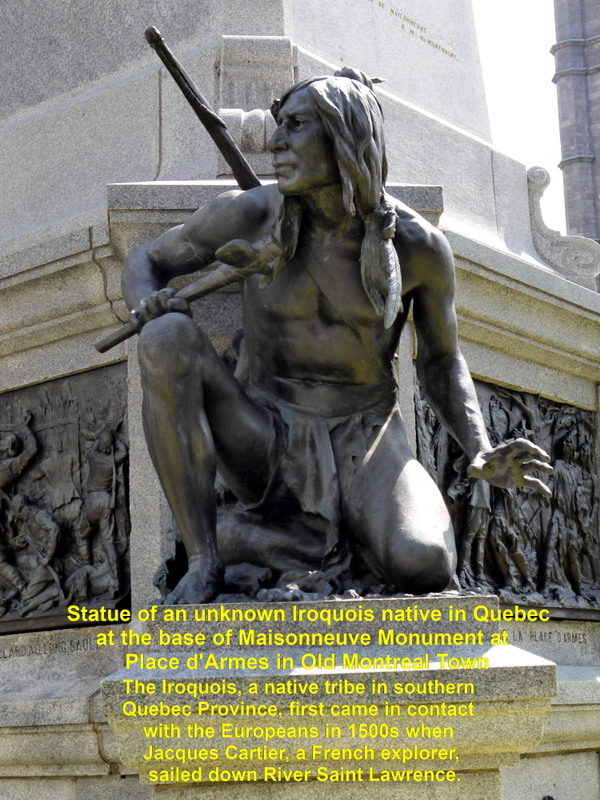 The Iroquois was a native tribe in Southern Quebec Province. 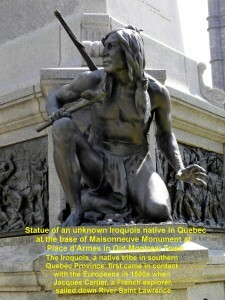 They first came in contact with the Europeans in 1500’s. They encountered a French navigator and explorer, Jacques Cartier, when he sailed down River St. Lawrence in 1534. Jeanne Mance, a nurse, established the first hospital, Hotel-Dieu, in 1645 in Montreal. Closse, a sergeant-major, won many combat fights against the Iroquois in Montreal. Charle Le Moyne fought many wars against the Iroquois. 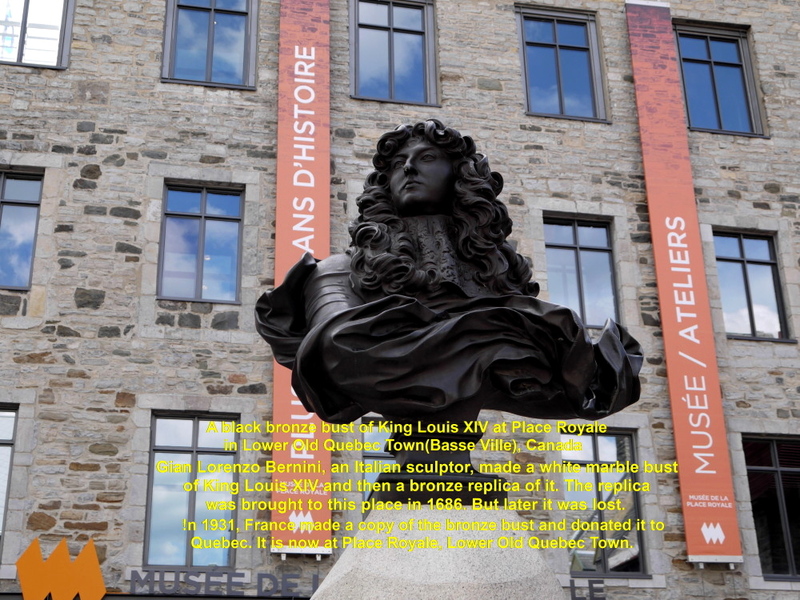 In 1672 he became the Lord of Longuell, and in 1673, a feudal lord at Chateauguay in Quebec. 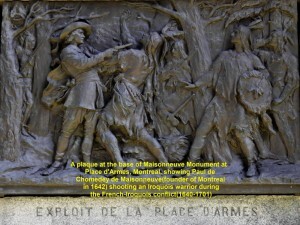 Besides the bronze figures on the square base of Maisonneuve Monument, there are four bronze plaques on its sides too. 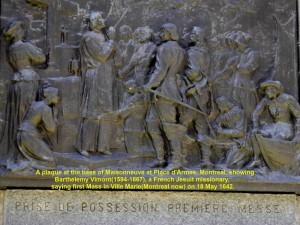 Each plaque depicting an important event happened in Montreal in the olden days. See them below. 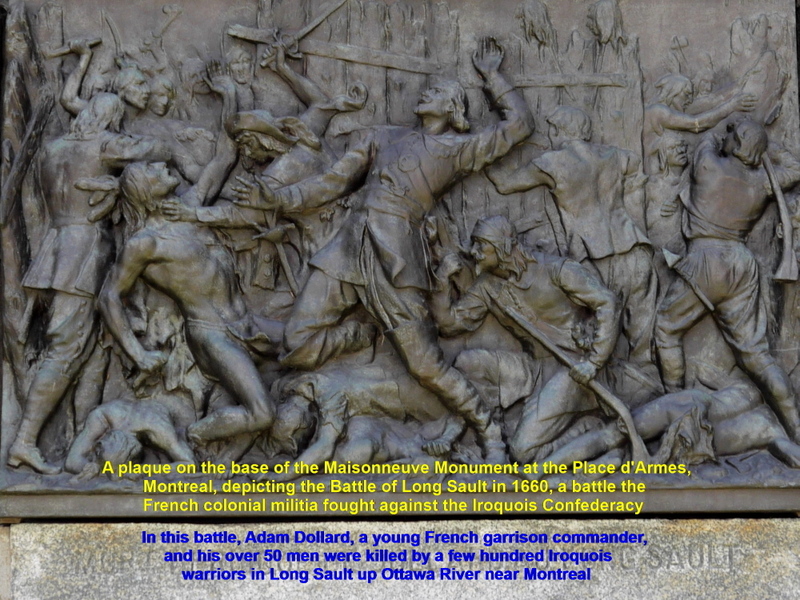 This bronze plaque shows Adam Dollard des Ormeaux, a young French garrison commander, and his over 50 men were ambushed and killed by over 300 Iroquois warriors in Long Sault up River Ottawa near Montreal in 1660. 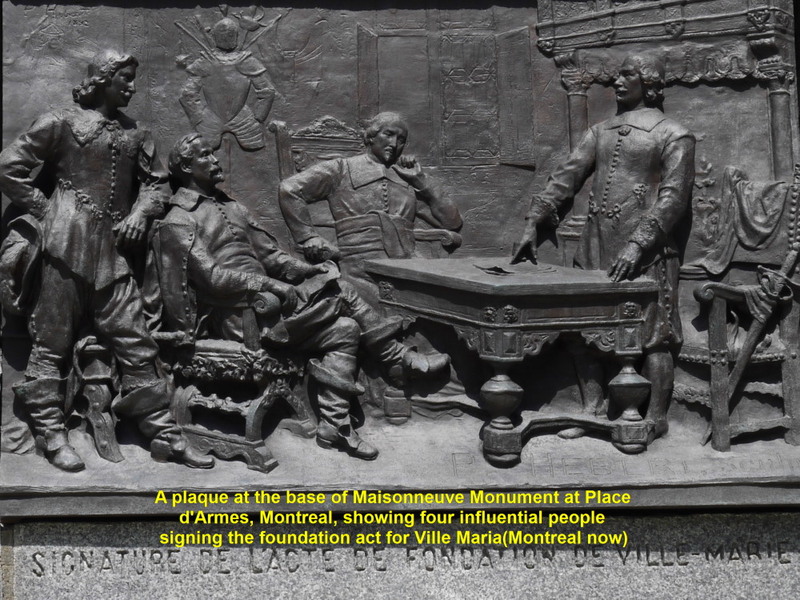 This plaque shows Barthelemy Vimont(1594-1667),a French Jesuit missionary saying first Mass in Ville Marie(now Montreal) on 18 May 1642. 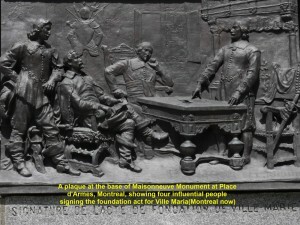 This one shows four influential people signing the foundation act for Ville Marie(now Montreal). 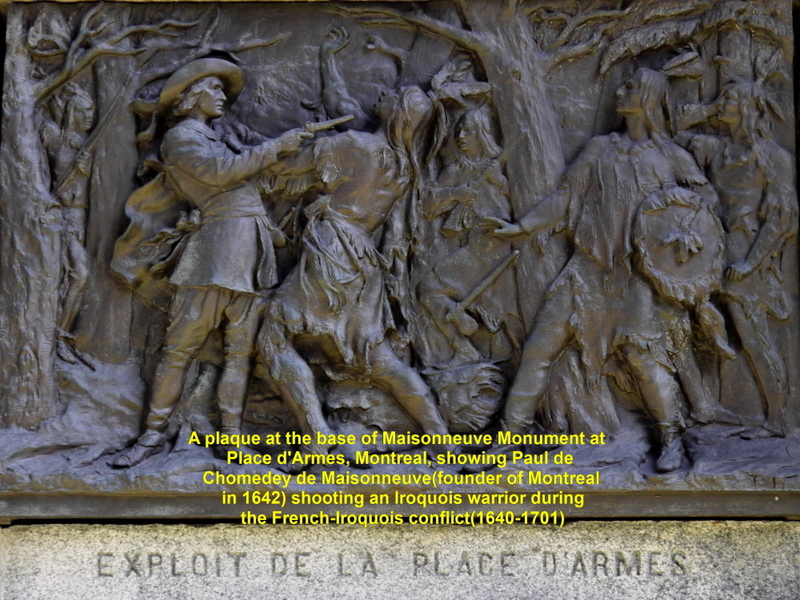 This last one shows Paul de Chomedey Sieur de Maissonneuve, the founder of Montreal in 1642, shooting an Iroquois warrior during the French-Iroquois conflict(1640-1701). 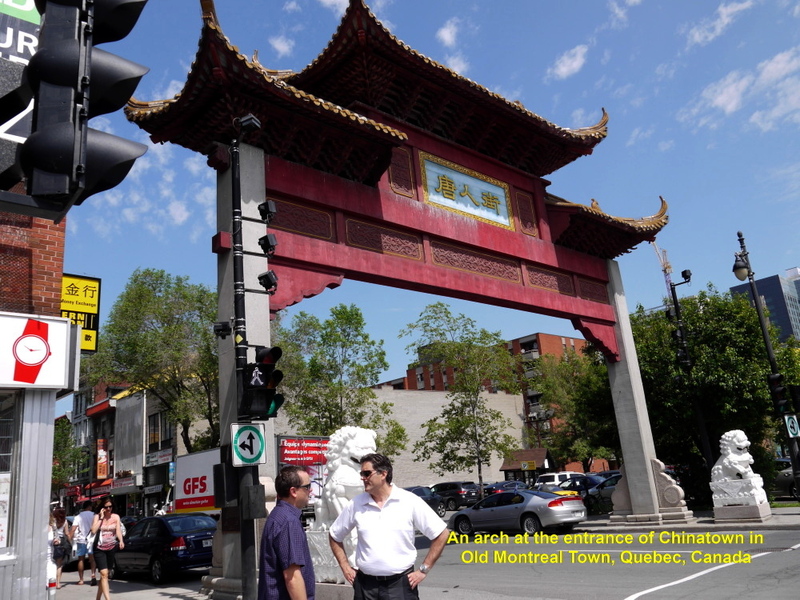 At 11 a.m. we left Place d’Armes and walked a short distance to Chinatown. There were many Asian restaurants in that area. My wife and I entered a Vietnamese restaurant and ordered for ourselves beef noodles for lunch. After that delicious meal at 12.30 p.m., we left Montreal and travelled 260 km north-east to Quebec City. 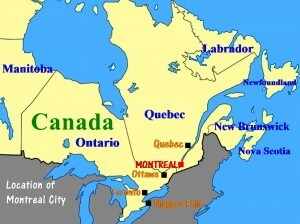 It was a long journey from Montreal to Quebec City. 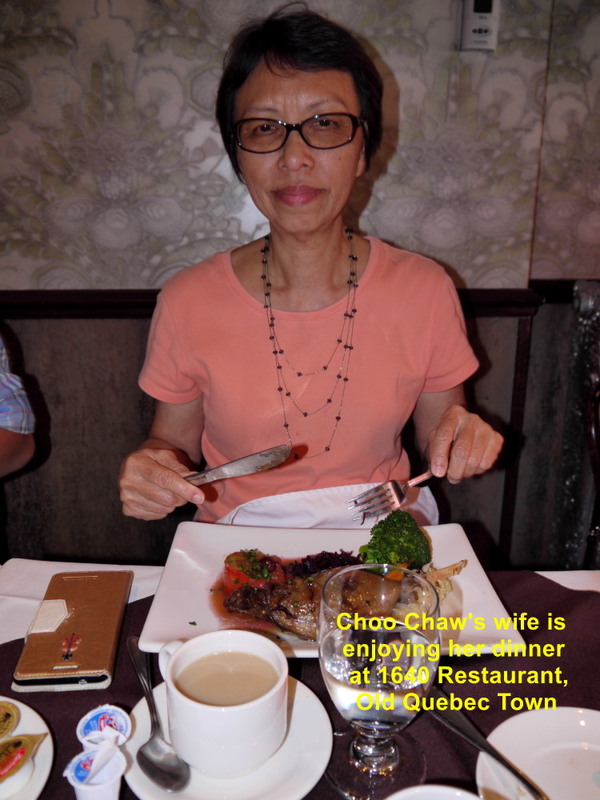 It took about four hours and thanks to our amazing, super coach-driver, Roanne, who brought us to the city, safely. 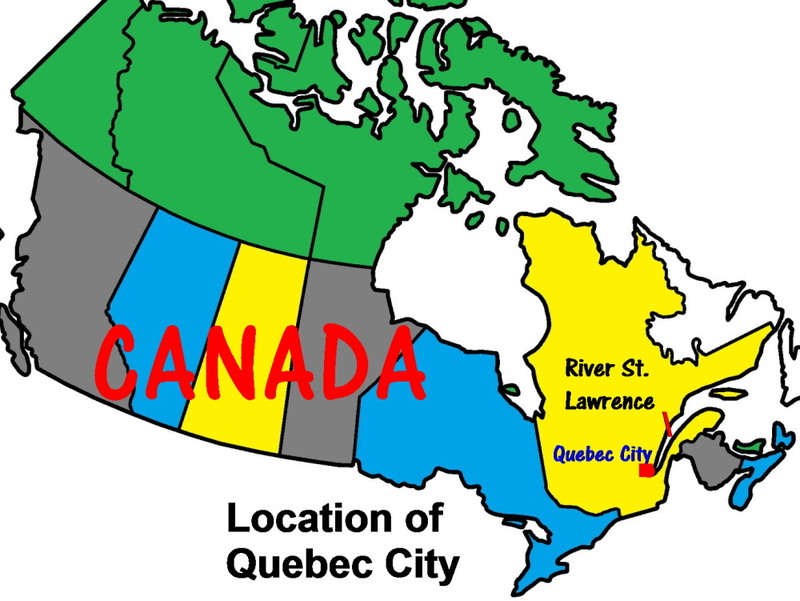 Quebec City is the capital of the Province of Quebec. 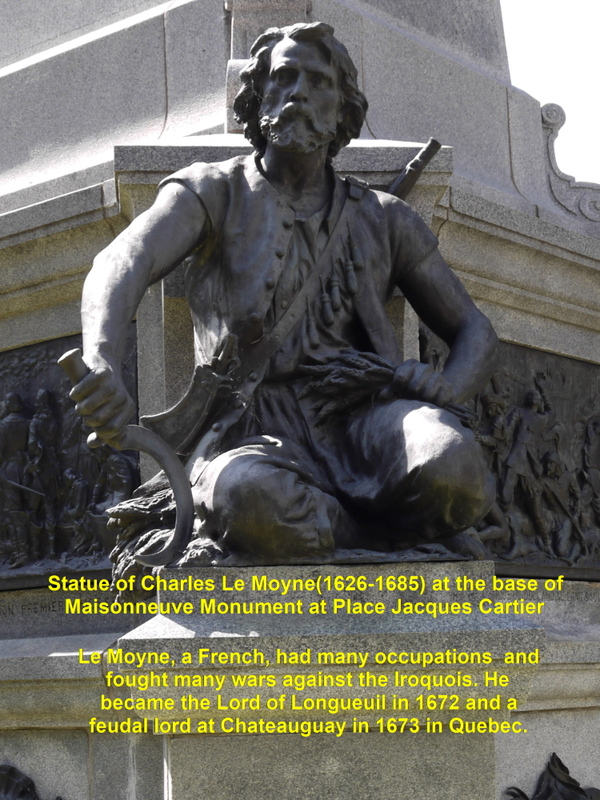 It was founded by a French explorer, Samuel de Champlain in 1608. 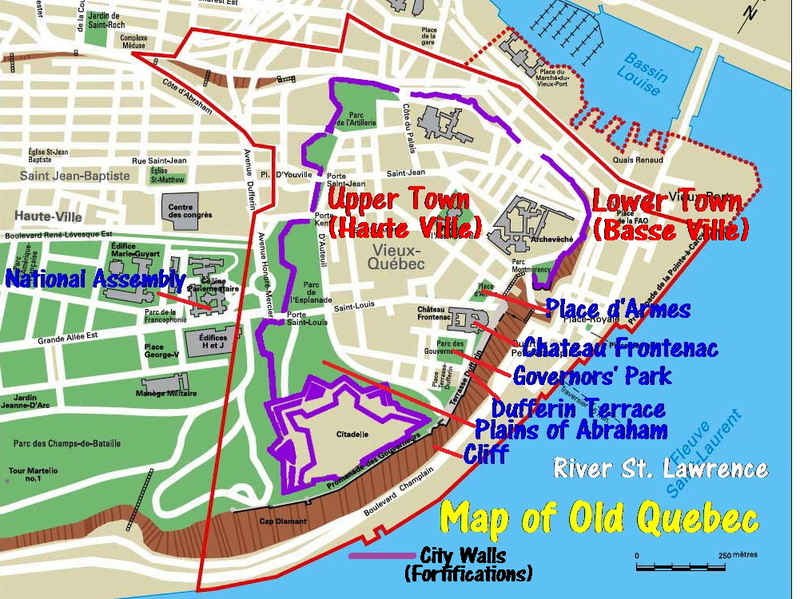 The old town of Quebec City is divided into two parts: Upper Town(Haute Ville) and Lower Town(Basse Ville). The Upper Town is on a promontory and Lower Town is on the bank of River St. Lawrence which is 50 metres below the promontory. 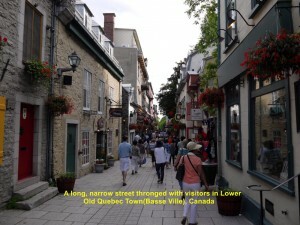 This old town was designated as a UNESCO World Heritage Site in 1985. The Upper Town of Old Quebec Town was fortified by stone walls by colonial powers, the French and British. 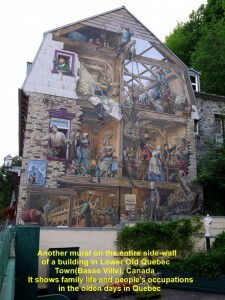 and part of it can still be seen. 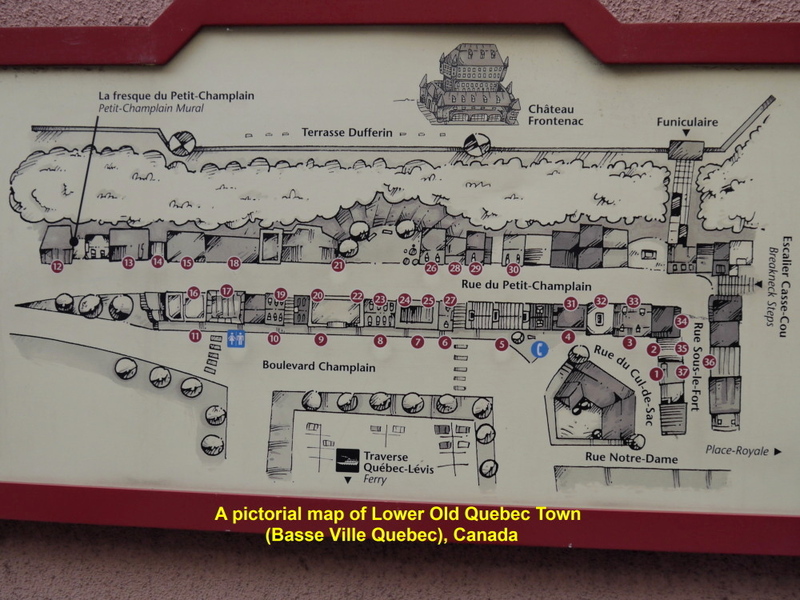 There are some historic landmarks we visited in Upper Town. 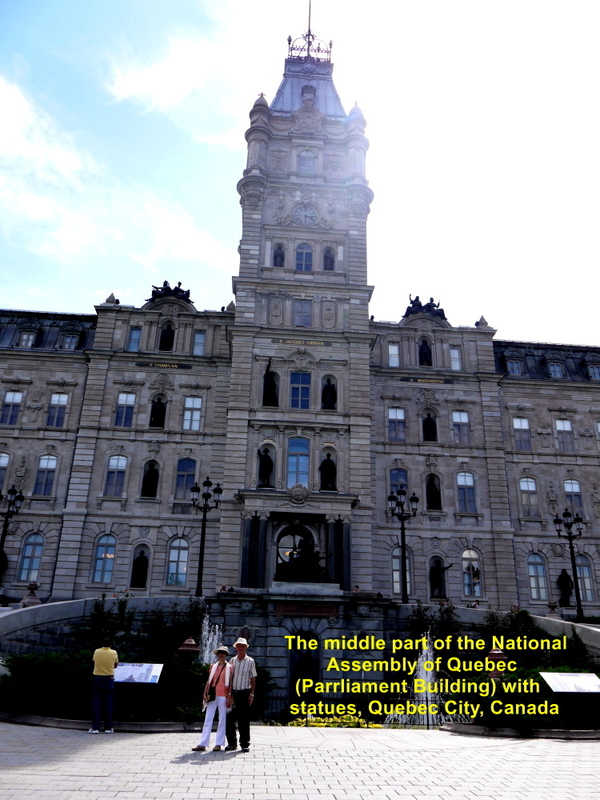 Parliament Building was the first one that we visited. 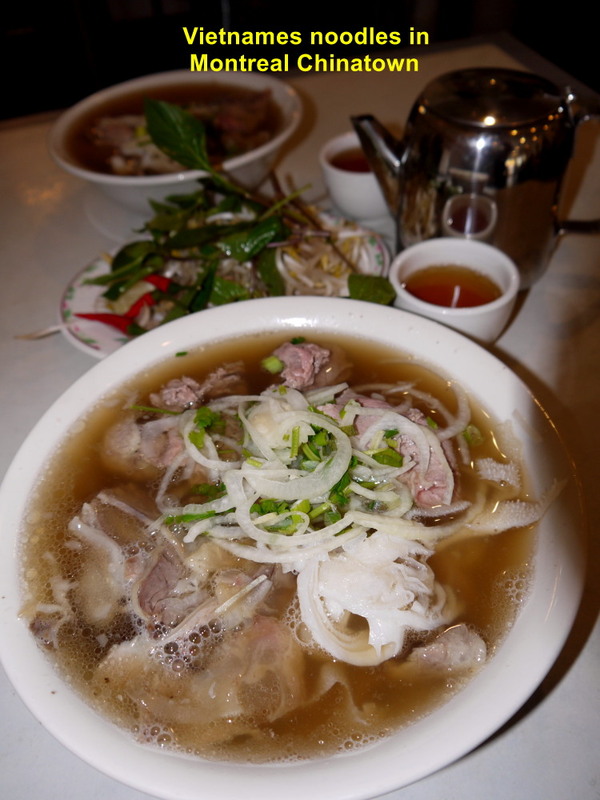 Subsequently, we visited more as described below. 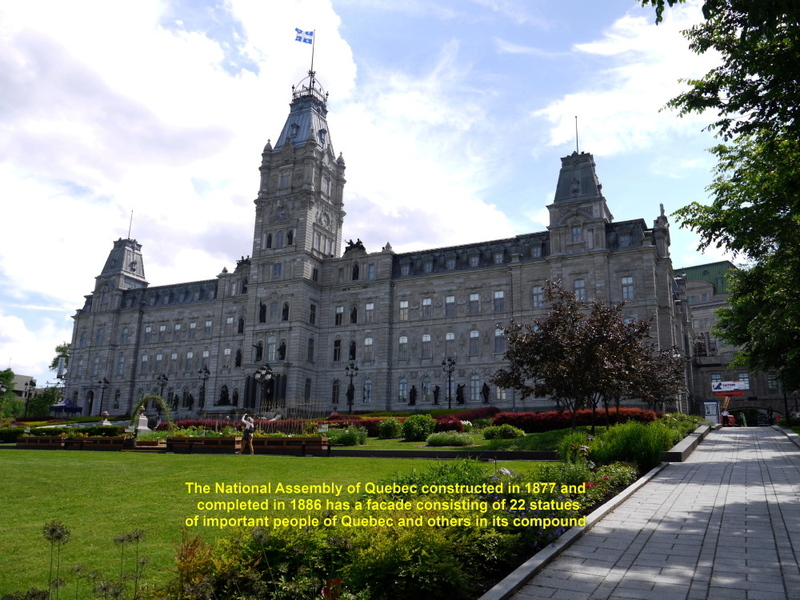 On arrival at Old Quebec Town city at 4.20 p.m., we, immediately, went to visit the Parliament Building. Constructed in second Empire architectural style of the 19th. Century in 1877-1886, it now houses the National Assembly of Province of Quebec. The assembly is the legislative body of the province and operates the same way as the British-style parliamentary system. 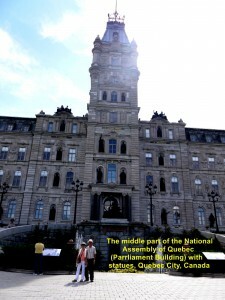 The Parliament Building has a clock tower in the middle. 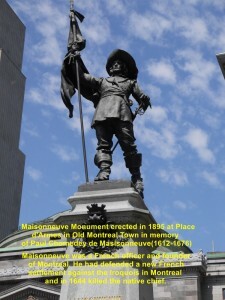 It carries many statues of important people of Quebec. Besides, more statues can be found in its large compound. Located in front of the Parliament Building is a beautiful French-style fountain. 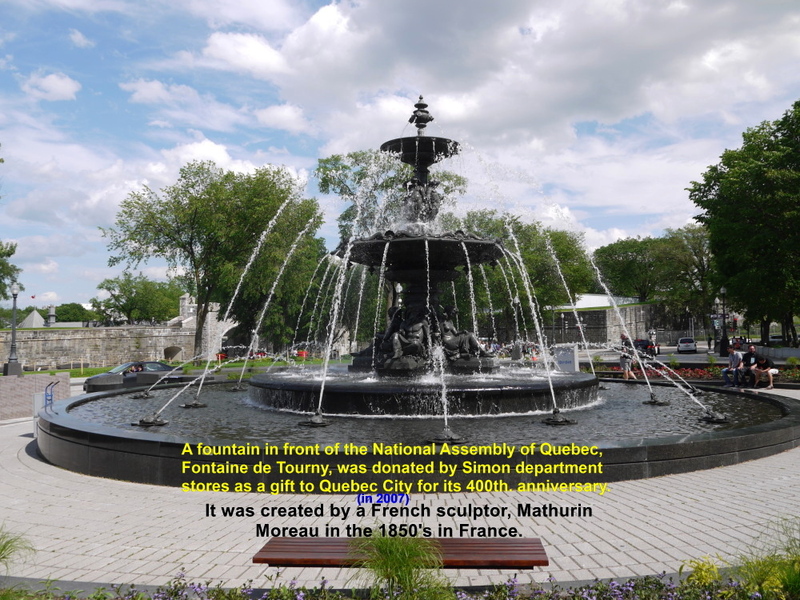 Known as Fontaine de Tourny, it was created by a French sculptor, Nathurin Moreau, in the 1850’s in France. In 2003, Peter Simons, owner of department stores in Quebec, bought it in France and brought it over to Quebec City. In 2007, he gave it away as a gift to the people of Quebec City for supporting his fashion retail business during Quebec’s 400th. anniversary celebration. 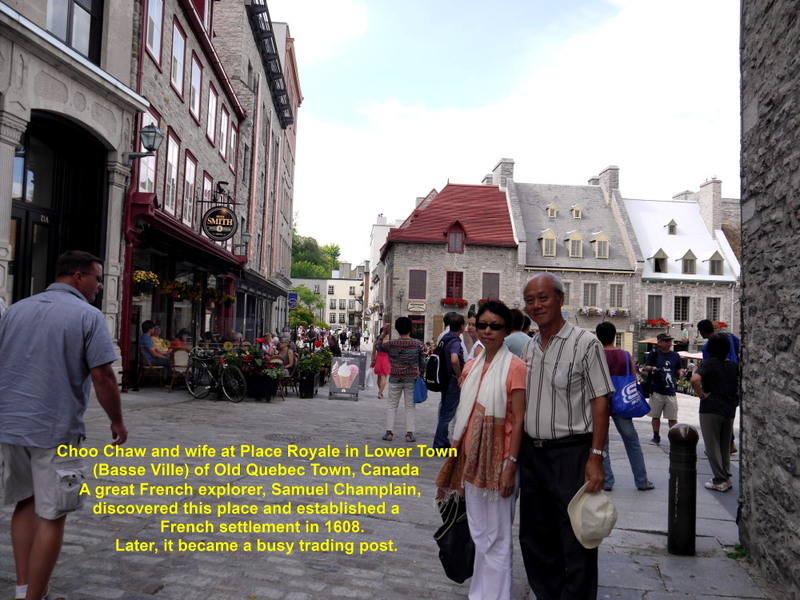 Later, we went to a place known as Place d’Armes nearby. It was a place for military drill practice and other activities in the colonial days. 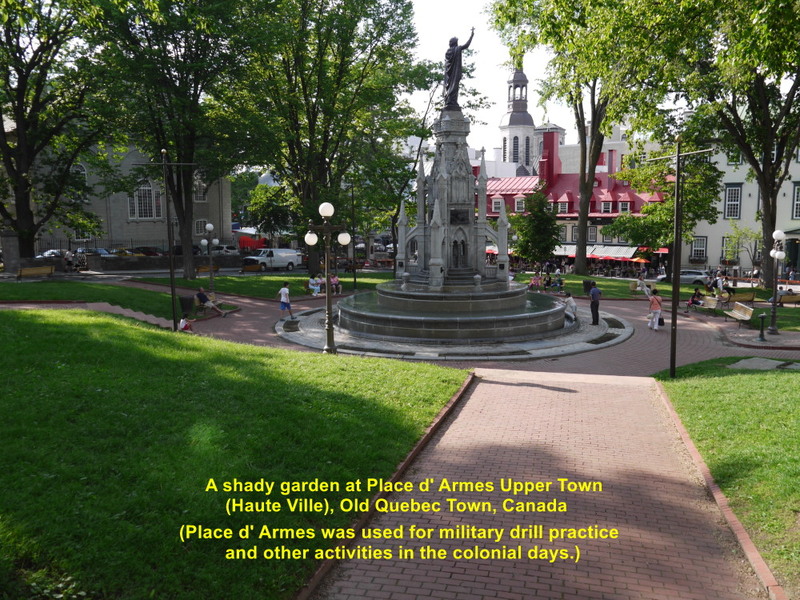 Now it has a shady garden where a monument is located. It is erected in honour of the Recollects Missionaries(Franciscans), a French reform branch of the Order of Friars Minor. 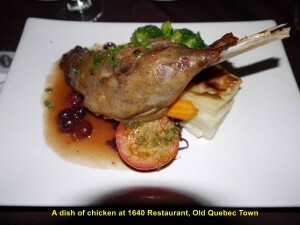 They came to Old Quebec Town in 1615. From the garden I could see a large, beautiful, and grand building that looked like a European castle of the 15th. Century. 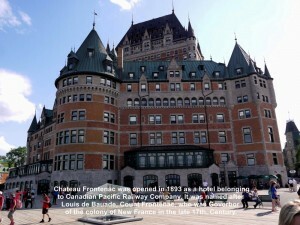 That “castle” dominating the sky is actually a hotel built by Canadian Pacific Railway Company. Opened in 1893, it is called Chateau Frontenac named after Louis de Buade, Count Frontenac, who was a governor of the colony of New France in the late 17th. Century. 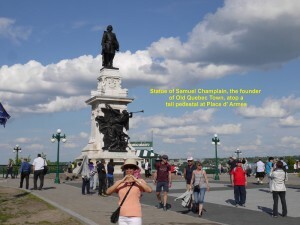 As I was walking away from the garden, crossing a road and going up a gentle sloping path, I saw a large statue of the founder of Old Quebec Town atop a tall pedestal. 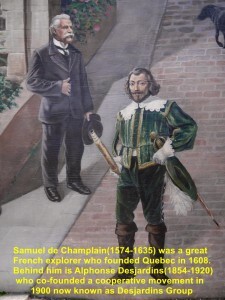 He was Samuel de Champlain who was a great explorer and founder of New France. 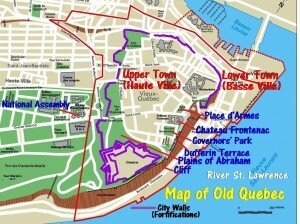 He founded Old Quebec Town in 1608. Just behind this monument is a long platform or walkway on a cliff. 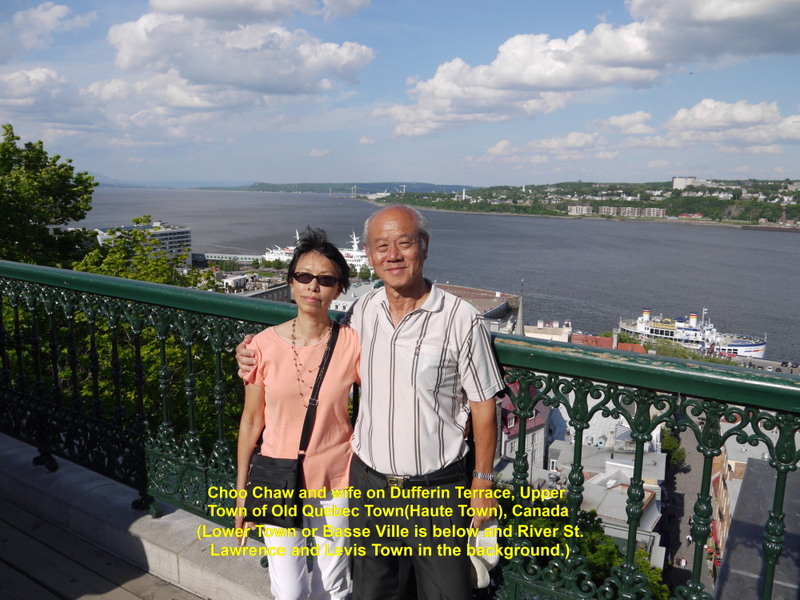 It is called Dufferin Terrace. named after Lord Dufferin who was the third Governor-General of Canada from 1872 until 1888. 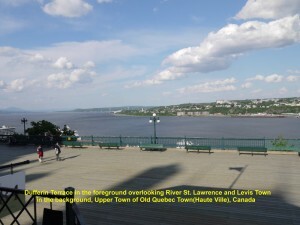 Standing on it I could see a breathtaking view of the Lower Town of Old Quebec Town or Basse Ville, the wide River St. Lawrence and a town, Levis, on the other side of the river. As I was walking down the Dufferin Terrace, I was enjoying the beautiful sceneries of River St. Lawrence on my left and Place d’Armes on my right. 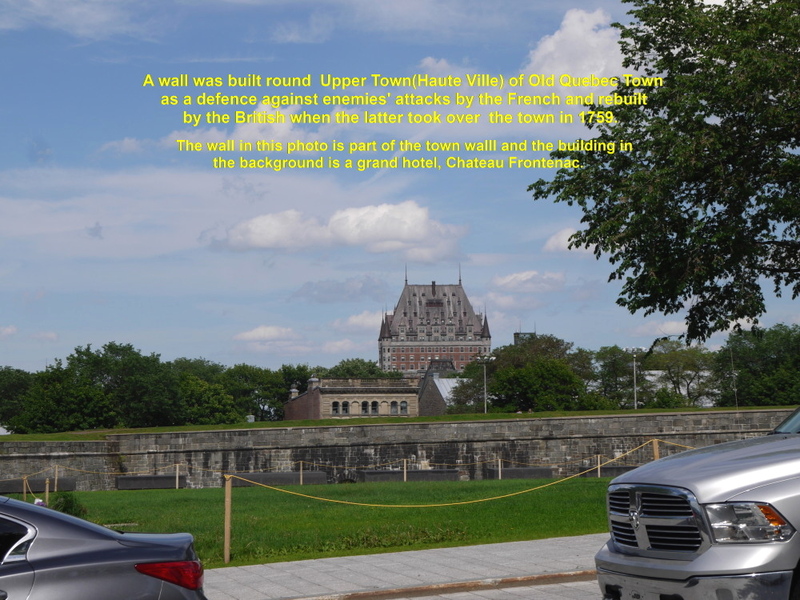 Soon I came to a park behind the grand hotel, Chateau Frontenac. 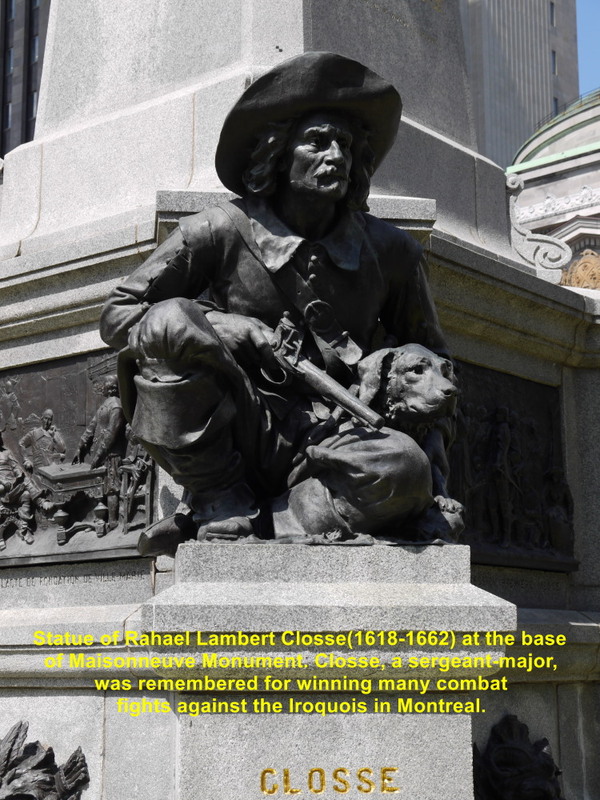 Known as Governor’s Park, it was there that a fierce battle was fought between the British and the French in 1759. 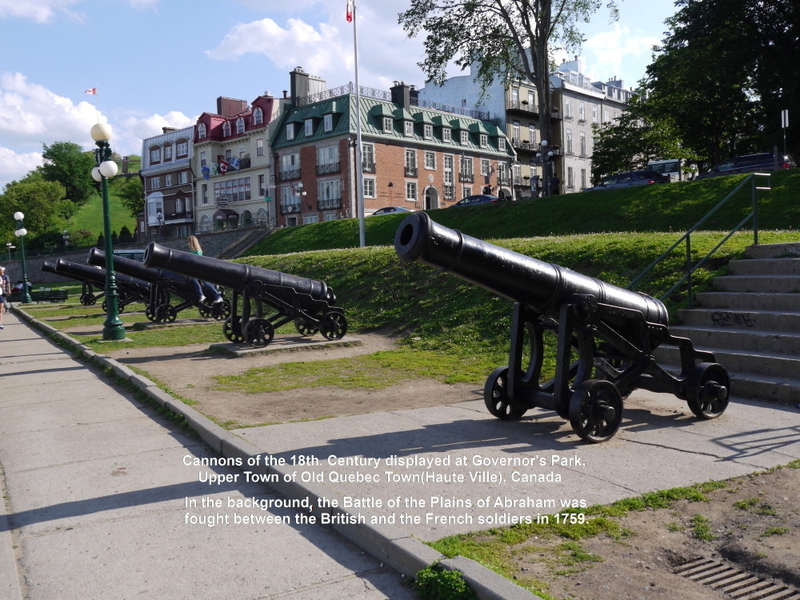 Two generals, one from each side, were killed in that battle, the Battle of the Plains of Abraham. 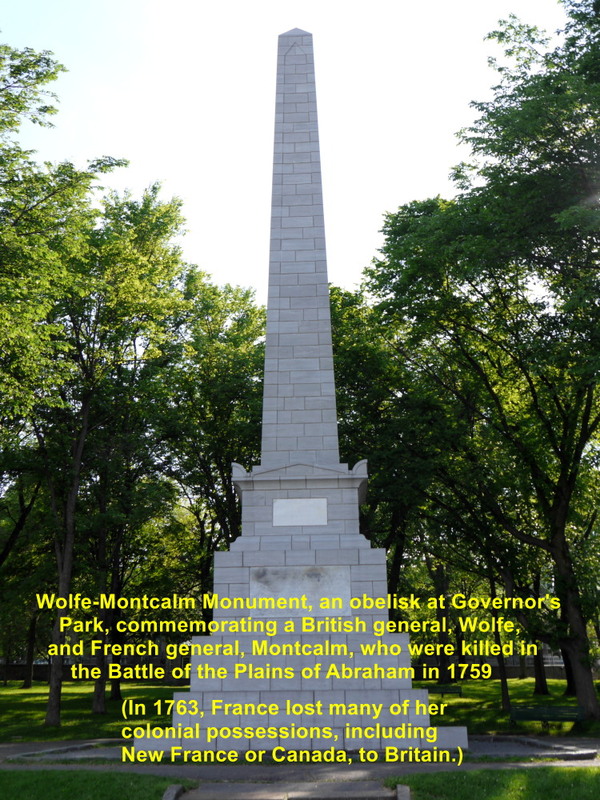 A monument in the shape of an obelisk with both the generals’ names, Wolfe and Montcalm, was erected at the park in memory of them. 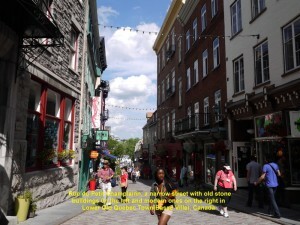 [In that battle British captured Old Quebec Town. In 1763, France lost many of her colonial possessions, including New France or Canada to Britain.] Near the monument there were five British cannons of the 18th. Century on display. Later, my wife and I walked down a road, Cote de la Montagne, to the Lower Town(Basse Ville) of Old Quebec Town. This place is a fascinating and charming quaint town. 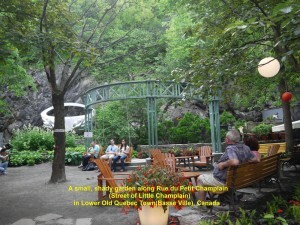 It is a place where buildings of French architecture of the 17th. and 18th. Centuries exist. 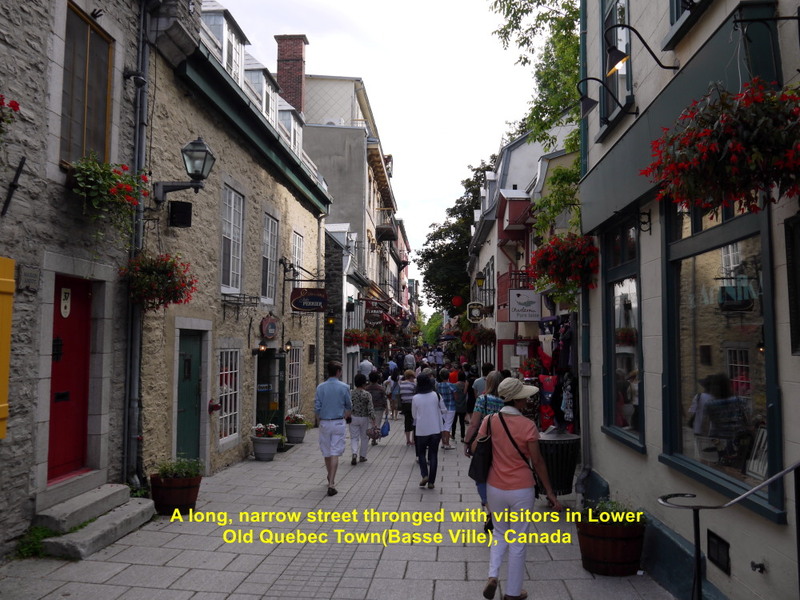 Walking down the streets and immersing ourselves in the small town made us feel as though we were in the town in the past. 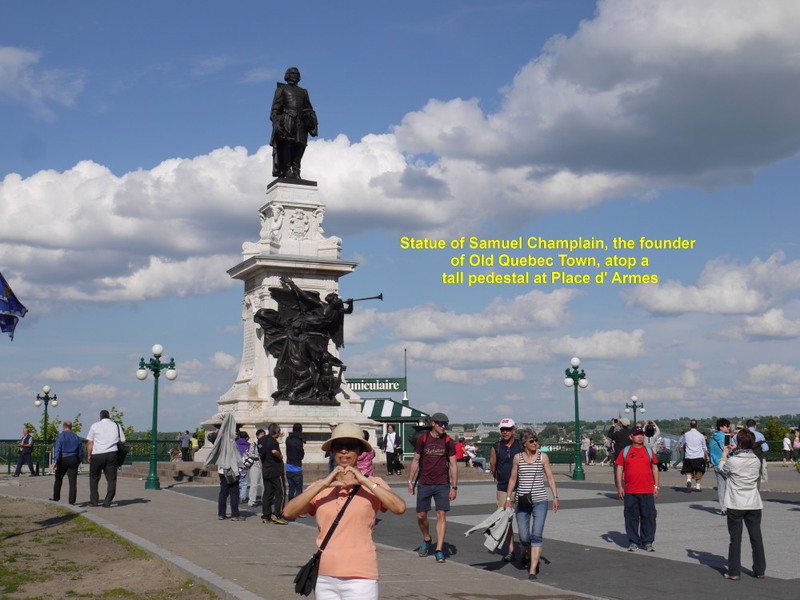 According to history, a great French explorer, Samuel Champlain(1574-1635), discovered this place and established a French settlement in 1608. Later, it became a busy trading post where French and British merchants exchanged goods. 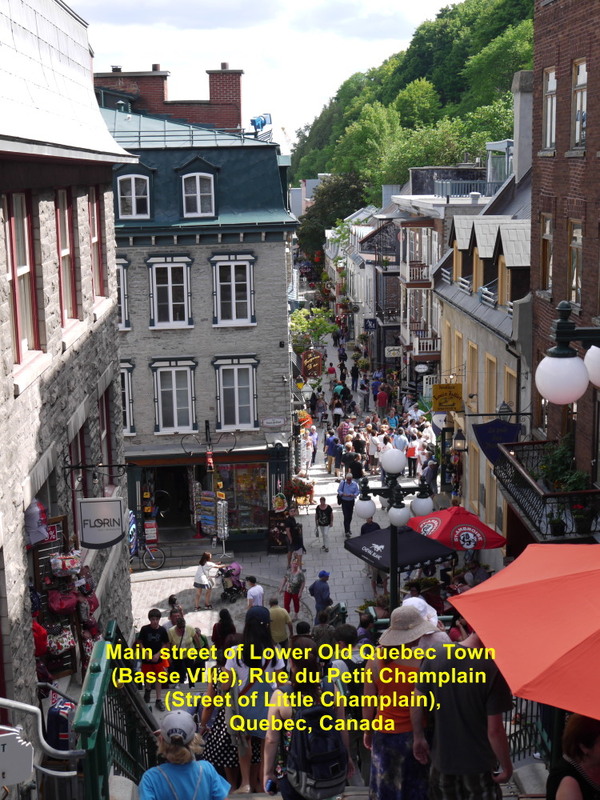 To get down to Lower Town from the road, Cote de la Montagne, we walked down two flights of steep, steel staircase known as “Breakneck Steps(Escalier Casse-Cou)”. 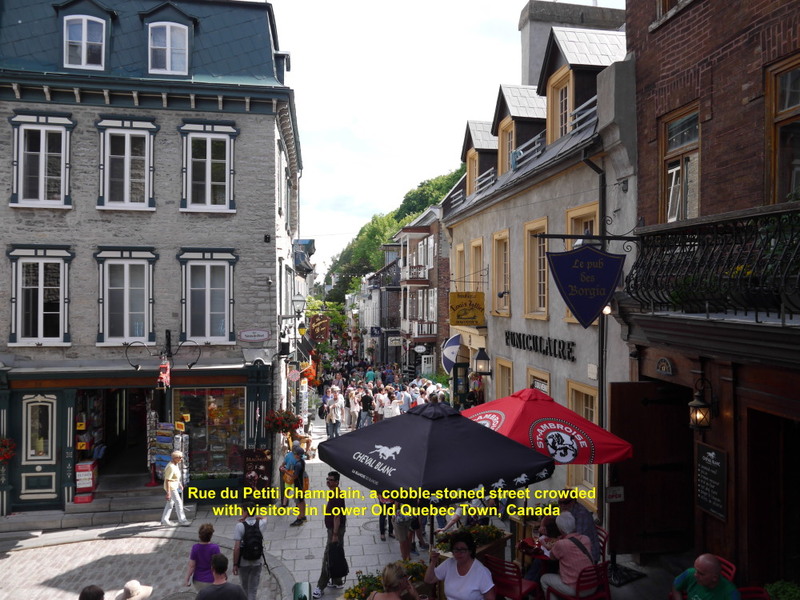 Stepping off the staircase, we were on the main street of the quaint town that looked like an old French settlement. 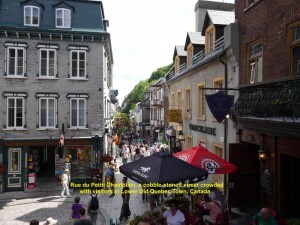 The street was teemed with visitors. 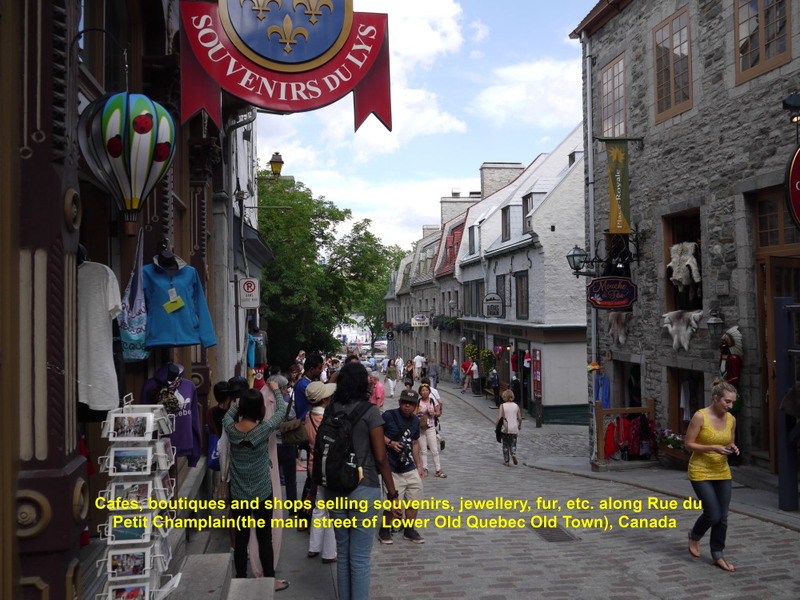 The street was cobble-stoned and narrow lined with restaurants, cafes, boutiques, and shops selling souvenirs, fur, jewellery. arts, handicrafts and snacks. 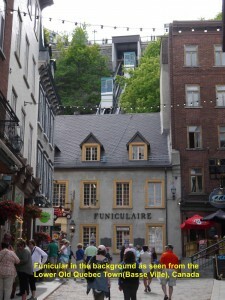 As we were walking down the main street, Rue du Petit Champlain, we saw a funicular or cliff railway on our right. 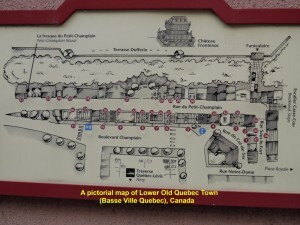 It connected the Lower Town to the Upper Town. 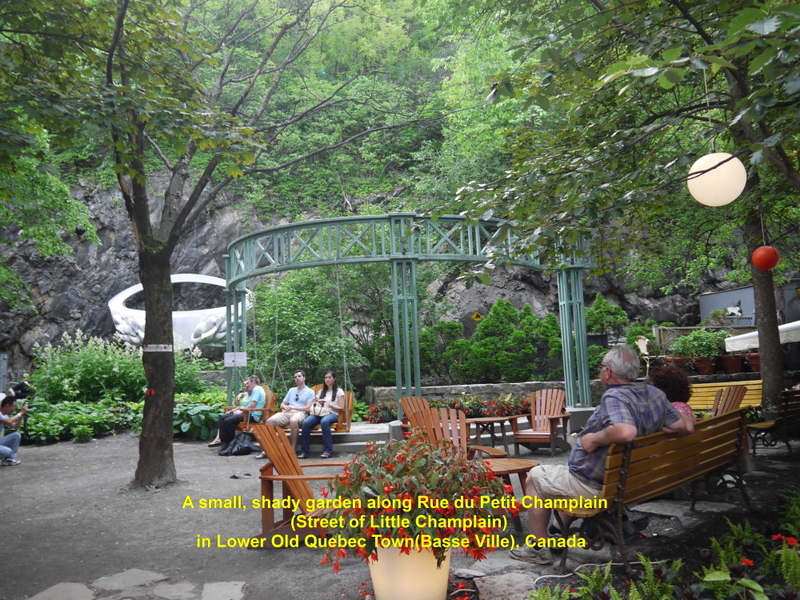 There was a small shady garden located halfway down the street. 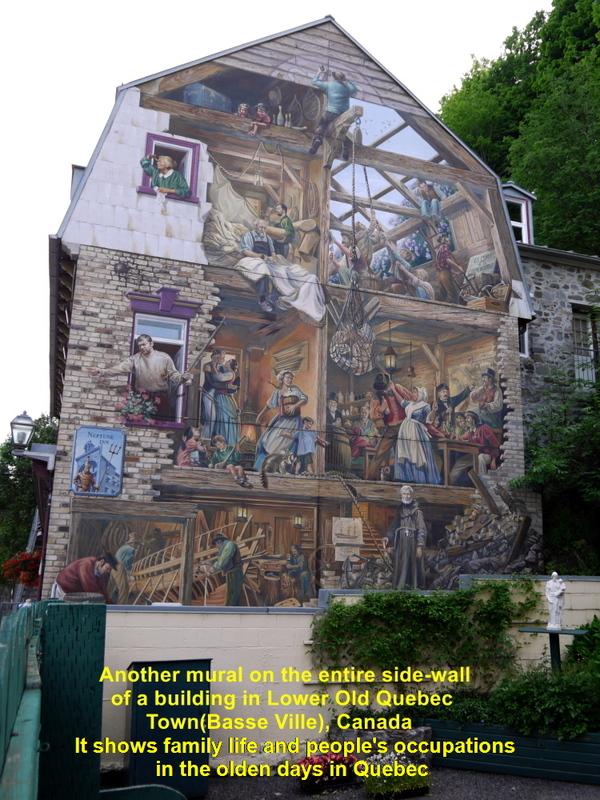 Two large murals on the whole side-walls of two buildings could be seen, too. 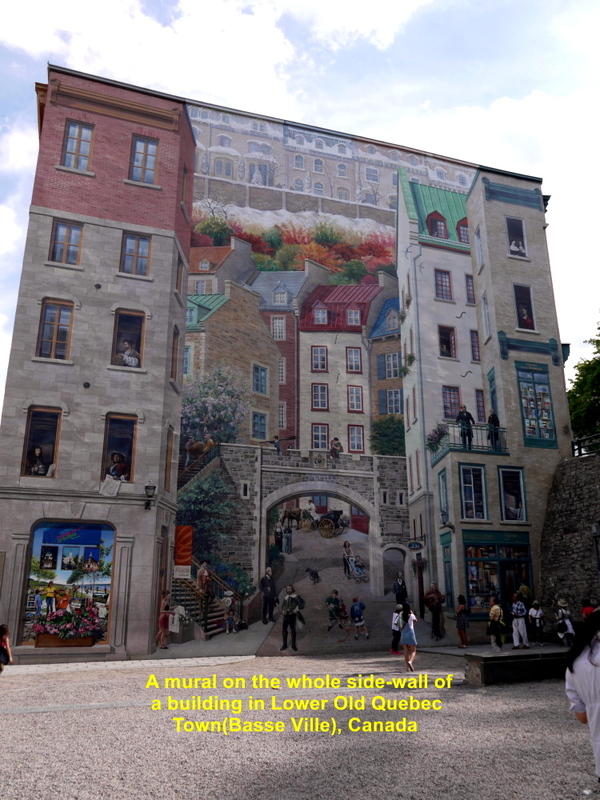 The large one known as “The Mural of Quebecers” showed pictures of important people in Quebec. 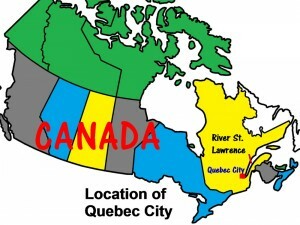 For examples, Jacques Cartier(1491-1557) who was the first European to travel inland in North America, Samuel de Champlain(1574-1635) who founded Quebec in 1608, Louis Jolliet(1645-1700) who was well-known for his discoveries in North America and Felix Leclerc(1914-1988) who was a famous Quebec singer and songwriter. 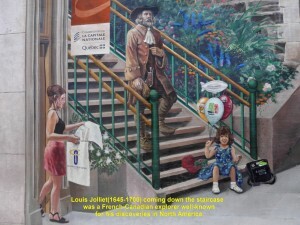 The smaller one depicted the family life and people’s occupations in the olden days in Quebec. Samuel de Champlain founded Old Quebec Town in 1608 and Alfonse Desjardins co-founded Desjardins Group in 1900. A small square, Place Royale, in the Lower Town was a market place in the olden days. A small Roman Catholic stone-church, Notre-Dame des Victories, that was built in 1687-1723, is located in this square. 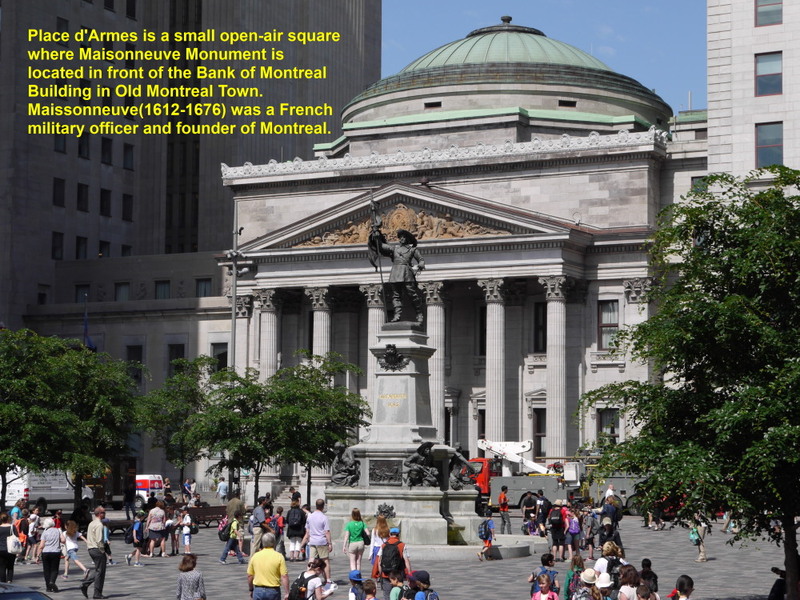 In the centre of this area stands a tall pedestal with a bust of a French king, Louis XIV, atop. 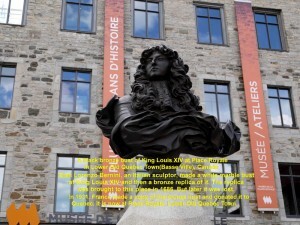 Glan Lorenzo, an Italian sculptor, made a white marble bust of King Louis XIV and then a bronze replica of it. The replica was brought to this place in 1686. But later, it was lost. 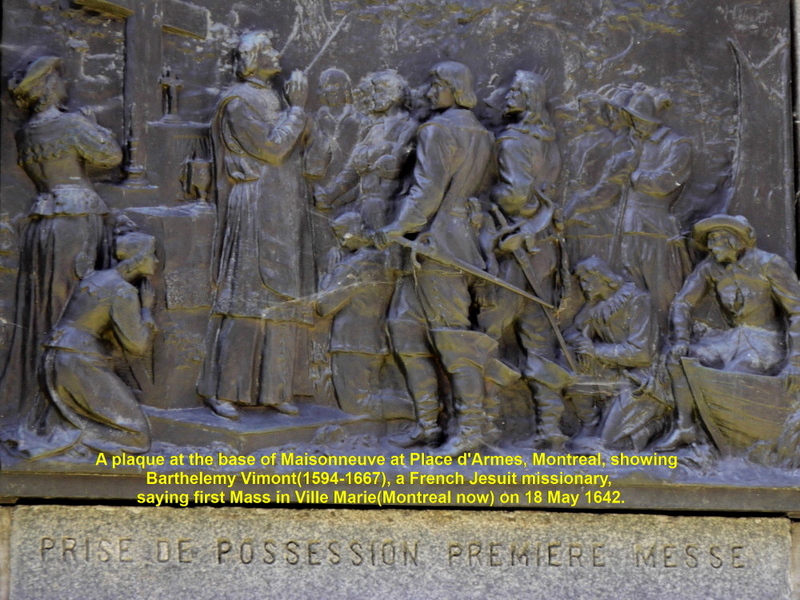 Then in 1931, France made a copy of it and donated it to the place. At 6 p.m. we left the Lower Town and went to a French restaurant known as 1640 Restaurant at the Upper Town to have dinner. 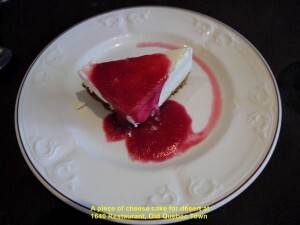 I had a chicken dish and small piece of cheese cake for the meal whereas my wife had beef and the same cake for dinner. 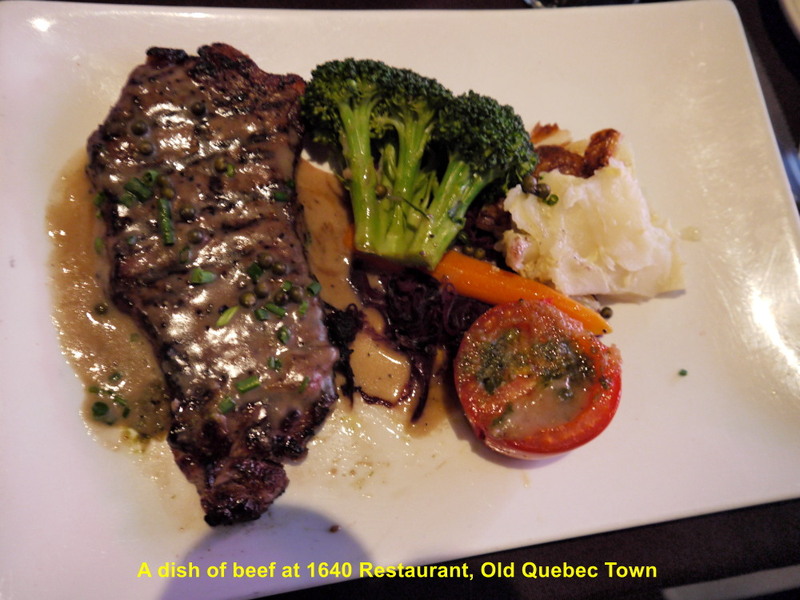 After dinner we left Old Quebec Town and travelled several kilometres south-west to a hotel, Holiday Inn Express, where we stayed for a night. Part I Philadelphia & Washington D.C.